Who must file a city of Amherst tax return? Resident individuals, 18 years of age and over, must file a city of Amherst tax return, even if no income is earned or no tax is due. Retired residents who have no taxable income are required to file an exemption certificate each year beginning in tax year 2016. Non-resident individuals who have earned income in the city of Amherst that is not subject to employer withholding must file a tax return. Also non-residents who own rental property or conduct business in Amherst must file, even if no tax is due. file an Amherst tax return, even if no tax is due. I am retired; am I required to file an Amherst tax return? As of January 1, 2016, the State of Ohio has mandated that all persons over the age of 18 are required to file a municipal income tax return regardless of income or liability. An Exemption Certificate can be filed in place of an income tax return if there is no earned income to report. The Exemption Certificate is printed on the reverse side of the Amherst income tax return and a copy is available on the Tax Forms for Individuals & Business page. Please keep in mind that W2 earnings, business income or loss, rental income or loss, and gambling and/or lottery winnings are taxable income even if you are receiving social security or pension benefits. I am a college student living on campus; do I need to file? Students away at school are usually considered to be domiciled at their parents’ address. If you have established domicile in another location, you should file a Declaration of Domicile form and attach as many of the supporting documents as possible so that your account can be closed. If you have not changed your domicile, filing a City of Amherst tax return is required even if no tax is due. An Exemption Certificate must be filed if there is no taxable income to report. Both the Declaration of Domicile form and Exemption Certificate can be found on the Tax Forms for Individuals & Business page. I rent an apartment or home in the city; do I have to pay tax? The tax collected by the city of Amherst is a tax based on income. All residents, whether they own or rent their home, must file a return unless they are under the age of 18. What is the city of Amherst’s tax rate? Amherst’s tax rate is 1.5%. One percent is allocated to the general fund for city operating expenses. The remaining one half percent is divided equally between the general fund and the street improvement fund. Do I receive credit for taxes paid to other cities? Residents receive a credit of up to 1% for taxes paid on the income taxed by other cities. What is the due date for the city of Amherst tax return? The due date is the Federal IRS due date (usually April 15th) or four months after the end of the fiscal year. If the 15th falls on a weekend, returns are due the next business day. Where do I mail my return and tax payments? Does the city of Amherst accept extensions? An extension is only an extension of the filing due date. Payment must be made by the original due date of the return or a late paying penalty of 15% of the tax due and interest at the applicable monthly rate for each tax year will be charged on any outstanding balances. If the extension request is not received by the original due date or the federal extension is not attached to the return when filing, a $25.00 per month (maximum $150.00) late fee will be charged. You may e-mail, fax, or mail your request to our office. We do not accept extension requests over the phone. Can your office help me prepare the city of Amherst tax return? The office staff is available to prepare City of Amherst tax return free of charge. All Federal documents as well as W2s are required to properly calculate your return. No appointment is necessary; however, to avoid a long wait time it is advised that you come to our office before the month of April. Tax payments will not be due until the IRS due date, even if the return is filed earlier. Our office hours are Monday through Friday, 8:30 a.m. to 4:30 p.m. The office is open extended hours during the tax season. Please see Income Tax Department for the specific times and dates. Do I have to pay estimated tax payments? Estimated tax payments for the current year are not mandatory; however our office will mail quarterly bills if an estimate is set up on your annual tax return or if a bill is requested. Please note that a late paying penalty of 15% of the tax due and interest at the applicable monthly rate for each tax year will be charged if the tax balance is not paid by the Federal IRS due date. I cannot pay my taxes in full; do you accept partial payments? The city of Amherst will accept partial payments on taxes due; however, if your balance is over $500.00, a Cognovit Note showing monthly payments must be signed. It is advised to file your return by the tax return due date to avoid the late fee of $25.00 per month (maximum $150.00). Payments must be made on a monthly basis to avoid delinquent notices. A 15% late paying penalty will be charged on any tax balance not paid by the due date. Interest will be charged on any unpaid tax balance at the applicable monthly rate for each tax year. Direct debit of your checking or savings account is also available. Please contact our office for more information on this program. Does your office handle property taxes? 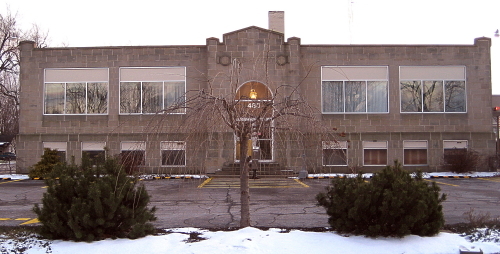 The Lorain County property tax office located in the Lorain County Administration Building in Elyria,Ohio, handles property taxes. Their phone number is (440) 244-6261. Can you answer questions concerning State or Federal Taxes? Questions concerning State or Federal taxes should be directed to those agencies. 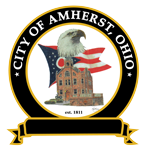 The City of Amherst Income Tax office can only respond to questions concerning the income tax for the City of Amherst.